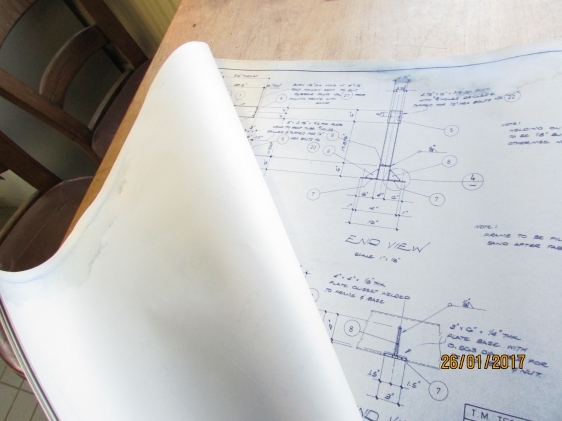 Deze blueprint bevatten plannen voor 3 verschillende Zelf-te-Bouwen-luchthamers Van klein benchtop-model tot grote op de vloer staand model. Incl. specificaties van materialen en profielen. Voor uitgebreide omschrijving zie hieronder. 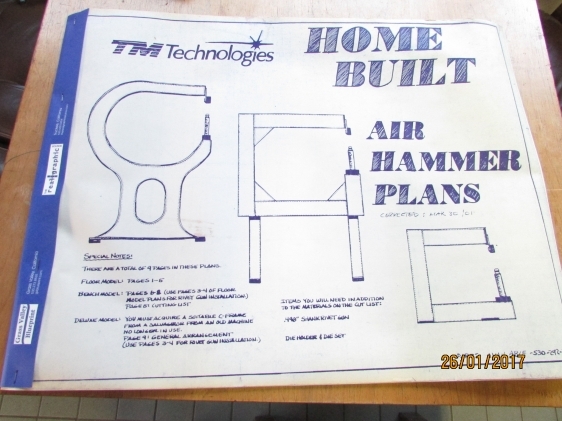 This set of 18″ x 24″ blueprints contains plans for three different “Build Your Own” Air Power Hammer styles. Included are drawings for two of our popular tube-frame styles – our Benchtop 1000 model, and a welded-steel Floor-Model version. The stout 4″ x 6″ rectangular tube frame has a 25.5″ throat and 10.5″ tall lower die-post assembly that enables many steel parts – from deep motorcycle fenders to automobile patch panels – to be worked with ease. Even custom aluminum tanks are easily made on these hammers! The stable, compact frame has been designed so you can easily add sound-deadening and stabilizing if desired. Also included are blueprints for a “fancy” floor model you can build using a “recycled” lumberyard cast-iron bandsaw frame. Plans include the specifications and profiles for constructing a Basic Upper Die and 3-piece lower die set (or you can purchase these directly from our company). 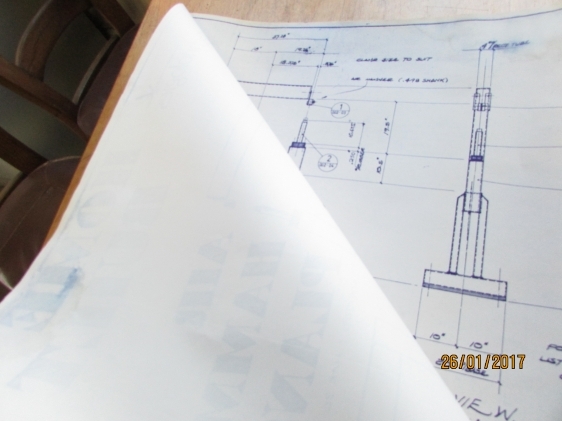 These plans also include drawings for a simple upper clamp for holding the air motors, and a lower die post assembly for the truly budget conscious who want to make these parts themselves. However, please note that these parts are welded and do not offer the same refined operation as the machined assemblies we sell. If you prefer to purchase pre-built parts please see our Quick-Lock Motor Mount (SMS-0272-T) and our Straight-Post Lower Assembly (SMS-0271) below. Both of these items are superior to the DYI fabbed parts, however you won’t get to make the parts yourself. 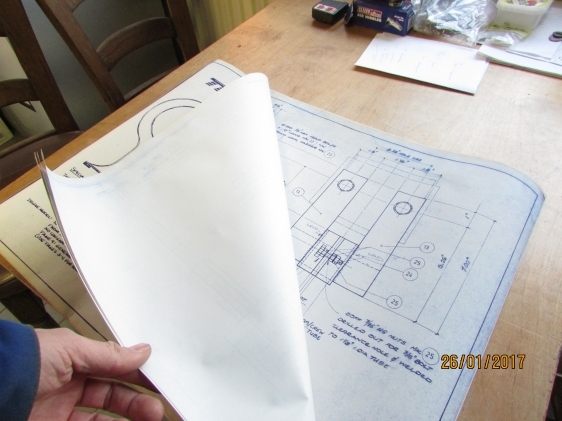 We now offer two 'Build-Your-Own’ Kits to make building your own machine even easier than building from our plans! Our "Frame Kit” comes with all the pre-cut parts you need to fab your own frame. And our “ Parts Kit” includes all the upper and lower assembly components at a discounted price. See items SMS-1000-BYO and SMS-1000-FK below for details. Note: You will need to purchase at least one air motor and one Complete Air System to operate a “Build-Your-Own” machine built from plans.